As both a classic Rock and Progressive Metal fan, Prog Rock is a genre I’d really like to explore more, and while I wasn’t quite sure what to expect from QOPH, a psychedelic/Prog band from Sweden, a few listens to their newest release sold me pretty quickly. Well, relatively quickly, that is, since the album clocks in at over 77 minutes in total length. “Glancing Madly Backwards” is also only relatively new, as it is a collection of rarities and unreleased tracks from throughout the band’s 20 year career, and the various lineups from throughout the band’s history are represented. The band wrote their music completely in Swedish until 2001, when they began writing in English, and the album reflects this with a fairly even split between these two periods material-wise. Genre labels are often convenient ways to distinguish between kinds of music, but they do bands like QOPH a disservice due to the range of styles found in their music. First track “Resh” is has a noticeable Hard Rock edge to it with its bluesy, strutting guitar riffs played with slight changes in time signature, and the groovy lead guitar lick that starts before the line “I’ve been waiting for the sun…” The aptly named “Metamorphosis” is a fun track for its sheer variety, taking cues from psychedelic Rock as much as it does classic Rock, Doom Metal, and traditional Metal while shifting moods effortlessly and entertainingly. “Anticipations” is another great track, with Robin Kvist’s lyrics (which have a down-to-Earth, working-man vibe to them) paring excellently with the song’s strange yet logical melodies and progressions. What really makes the song is the chaotic, almost free-Jazz conclusion to the song, with its alien synth sounds and thumping bass licks. The centerpiece of the album is the colossal “Kalejdoskopiska Aktiviteter,” basically an 18+ minute jam session from around the time the band released their first album, with which this song shares its name. There is so much going on over the duration of the song, ranging from moments of Blues-Rock goodness to spacy Psychedelic passages to its jazz-inspired midsection, all wrapped up in one convenient package. The second half of the record gets into the Swedish-language tracks, which impressively flow just as well as the ones sung in English do. “Rastlös” has such a great, carefree, swinging feel to it that it basically renders irrelevant the fact that I have NO idea what’s being sung about. That’s the cool thing about music; it’s a language that everyone around the world can relate regardless of where they’re from. 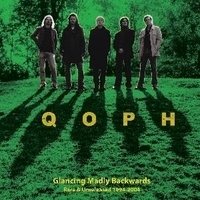 Many bands claim to be unique, but QOPH has a truly creative sound of their own that is on full display throughout “Glancing Madly Backwards.” The band has a great feel for songwriting, sounding just as focused and engaging on their shorter, more straightforward songs as they do on more involved compositions like “Kalejdoskopiska Aktiviteter” and the fantastic “Förförande Rädsla.” They find a great balance with music that is memorable and catchy while still being challenging and unconventional at the same time. “Glancing Madly Backwards” is a real treat for fans of Progressive Rock, and serves as a great introductory work for those, like myself, who have not yet had the pleasure of listening to this eccentric yet talented group.